Check the owner's manual to see if your driving habits are considered to be "severe service." This type of driving requires more frequent oil changes, warns the Car Care Council. Have the oil changed accordingly, usually every 3-5,000 miles. For less wear and tear on the engine, drivers in cold climes (sub-zero driving temperatures) should drop their oil weight from 10-W30 to 5-W30. Your mom and dad would probably suggest simply moving to someplace warmer. Description: The typical oil filter consists of a high-strength steel housing containing various types of filtering media. An anti-drainback valve prevents oil from running out of the filter when the engine is off. Today's oil filters have a convenient spin-on design that makes removal and installation easy. Purpose: The oil filter sifts out contaminants, allowing the oil to flow through the engine unrestricted. 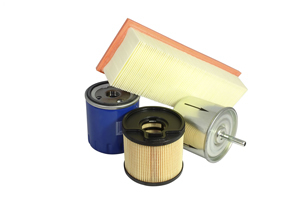 Should the oil filter become restricted or clogged with contaminants, they will flow around the filter. This bypassing is a safety mechanism, but you never want to let oil and filter changes go so long that bypassing takes place. Maintenance Tips/Suggestions: For best results, consult your owner's manual, but consider that your driving probably constitutes a severe maintenance schedule. Usually, this means oil and filter changes every 3,000 miles or 3 months. If you change the filter yourself, dispose of it properly. Take used filters to a facility that accepts them. Used filters can be crushed, removing the used oil and the steel part of the filter can be recycled. The oil from one used, seemingly innocent filter leaking into a landfill can taint 62,000 gallons of ground water.